What type of gun was used a couple of weeks ago, when that clown in Florida mailed out those fake bombs? Hint: that’s called an act of terrorism. Take deep breath Princess and think about that...I’ll wait. Hey dipsh!t a terrorist can use more than just a gun, so when you use terrorist statistics...it’s all inclusive. so when those mooslims in paris shot up the concert hall im sure u were like now wait just a minute on this whole terrorism business......those guys just had an axe to grind with punk rock. In depends on his search criteria on this site. He may be right. I just find it odd that it is 2017 data only. And the 9/11 pilots who crashed into the twin towers were just student drivers. Non Cheetos Jesus. If a mass shooting is not motivated by political ideology, then why does it matter what the person ideology is? The ex-marina that just killed 11 people is probably a Republican. Marines are the most conversation of all branches. If he killed them because PTSD does it matter that he a republican? 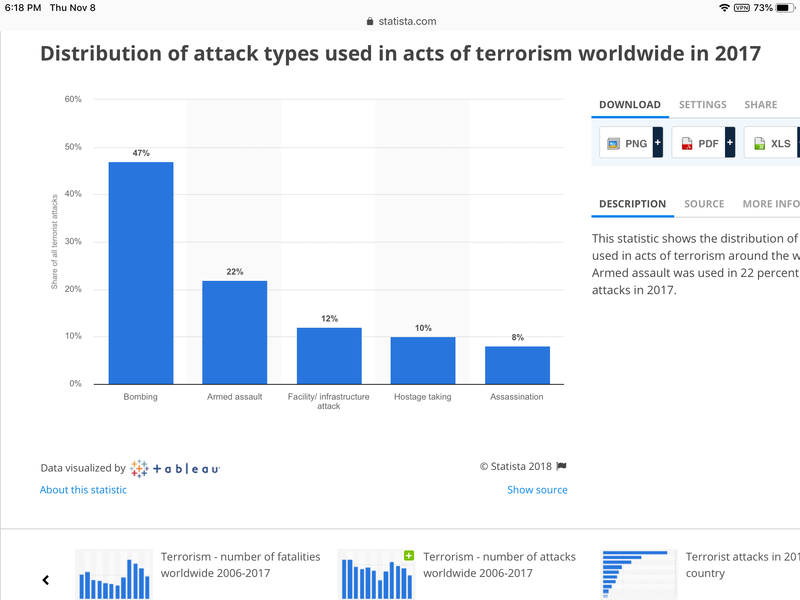 Here’s terrorist stats worldwide (seems odd it’s also from 2017). Notice that bombings is the preferred tactic. . .
Are you a hispanic female? Marina? Conversaton? Are you illegal? an outburst of violence by a mentally disturbed individual is not the same as terrorism. The idea of terrorism, is not an outburt, it's an act to sow terror in a entire group or nation. A crime is just a terrible crime. Here's woodpecker with Crazy Cleve and Crazy CCC taking turns at him. Whats odd about it? Right wing violence has increase since the self proclaim nationalist was elected. Maybe worrying why the 37 right-wing terror attack happen would be a better idea. Why the ADL reported a 57% increase in anti-semitic incident in 2017 and it will probably be higher this year. The FBI stat also show a big increase of hate crime because of race. And before you start your garbage about Nazi and Klan being left wing liberals. The Nazi and white supremacists ran on the republican ticket this year. Civil War democratic were conservatives. Liberal - open to new behavior or opinions and willing to discard traditional values. Conservatives - a person who is averse to change and holds to traditional values and attitudes, typically in relation to politics. Conservatives didn't want changes, they wanted to keep on owning people. A website tied to a candidate for the North Carolina General Assembly says God is a racist white supremacist and that Jews are descended from Satan. Russell Walker is a Republican candidate running for state House District 48 which includes Scotland and Hoke counties. A federal grand jury in Virginia indicted an Ohio man Wednesday with federal hate crimes in the death of a woman run down by a car after a "Unite the Right" rally in Charlottesville last summer. s anti-Semitism surges in the United States, according to numbers from the Anti-Defamation League (ADL), at least two self-declared Holocaust deniers will be on the ballot representing the Republican Party in US congressional elections in November, while a third candidate is contending in a Republican primary in the state of Wisconsin to replace the Speaker of the House, Paul Ryan, who is retiring. Woohoo another meme reply. Nothing says punt more then having to post a gif/meme. You're full of Sheet. Israel loves President Trump as evidenced by him moving the embassy to the rightful capital. So how Trump is responsbile for all this 'anti semitic' violence is beyond me. Obama was the one who hated jews. He hated israel also. So get your facts straight lady. It's odd because it has 40+ years of archived data and you chose 2017 as your reference to history. I even said you may be right. Have you read this far? When did I bring up Nazis and the Klan? Btw I'm not religious, you seem to be making some blanket statements yourself. Right.. So at the united the Right march, the guys canting "Jews will not replace us", they were pro-Israel? And the Trump rally where the guy in the red hat was screaming Jew S A, Jew S A, he also loves the Jews right? Why did the nazi and white supremacists run on the GOP ticket again? The racists can over look CJ be OK with the Jews. Since he is stopping the destruction of the white race by keeping all the brown people out of the country. Database has decades of data, use it and search for what you want. The author look into just last year. I have and it skews your statistics. To replicate I would need your exact criteria and then use it through the entirety of the archived data. I'll wait. You're blaming Trump for some march that he had nothing to do with. Not keeping brown out of the country. Only illegals. Try a better argument. Sorry they cut back regular legal immigration too. I guess the majority of Americans must be wrong. "A majority (54%) of Americans say that President Trump’s decisions and behavior as president have encouraged white supremacist groups, compared to just five percent who believe the president has discouraged white supremacist groups." I hate to be the bearer of bad news, but there’s no cure for Trump Derangement Syndrome. iys funny that when someone who may be a registered dem but not particularly politically active in anyway, is for sure a terrorist when the shoot up a bunch if people. But when a guy runs into a black church screaming N***** and shoots a bunch of people....nah thats just a disturbed outburst. Might as well face the fact everyone. With every one of these incidents public support grows for some kind of meaningless gun control. It won't be long until it happens. Then when there is virtually no change in the amount of crazy people seeking fame on social media people will be shocked but the gun control measures didn't stop anyting. But of course that isn't the point. This will be the thin end of the wedge. I strongly disagree, my Elvis-like friend - the truth is on the flip side.